Just like Properties in Windows, you can use Get Info on a Mac to see important details about a particular file like its size, location, creation date, etc. Are you looking for more flexibility? Get Summary Info and Inspector can help. Since some readers are new to the Mac platform, I’ll start off with a quick introduction on what Get Info does. The simplest way I can think to describe it is a method of getting an overview of your files. Select a file in Finder and either press Command+I on your keyboard or right-click and choose Get Info. A small window will pop up showing just about everything you’d ever want to know about that file. The file name, location, default application settings, keywords, labels, and more are shown. It’s an incredibly useful part of the Mac operating system. So that introduction briefly covers getting information on individual files — what about multiple files together? When you select 10 or less files at a time and invoke the Get Info window, you’ll be treated to separate windows filling up your screen space in rapid succession for each file. This is a desirable behavior when you want to compare file information side-by-side, but there are other times when you just want to get their combined file size. There’s a way to do that too. 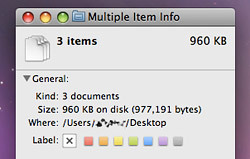 Try selecting a group of files in Finder and pressing Command+Control+I on your keyboard. Alternatively, you can right-click on the files once they’re selected, hold down the Control key, and select Get Summary Info from the menu. As the name suggests, a single window will display with a summary of those items — including the total file size of them all together. Did you know the Get Info window has a cousin of sorts? Indeed, it does and it’s called Inspector. Inspector offers yet another way to view file information on your Mac. They’re both very similar in what they show you, but with a single exception. A Get Info window stays locked on the file(s) you initially launched it from. In other words, it’s static once opened and doesn’t change until it’s closed. Inspector, on the other hand, is fluid and changes its contents to reflect what’s currently selected. To see what I mean, click on a file and press Command+Option+I. You can also right-click, hold down Option, and select Show Inspector from the menu. At a glance this looks exactly like what you’d see from a Get Info window. Without closing Inspector, select another file in Finder. Now try selecting multiple files at the same time. Ahh, that’s how it’s different… Inspector stays put on the screen, but updates itself with new information every time something is clicked. It’s really great for minimizing clicks and keystrokes when you’re working with a bunch of files. So there it is — a way to Get Info (including file size) on multiple items at once and an explanation about the subtle yet major functional differences between Get Info and Inspector. Feel like a pro yet? You should! Thanks for the Inspector tip! Thanks for the tip, I missed this feature from windows.